Taika Waititi’s Hunt for the Wilderpeople presents a boldly original voice and one that's filled with an offbeat humour, real sense of wonder and effortlessly touching emotion. Waititi tackles complex themes with a quiet ease through the lens of a carefree New Zealand teenager. 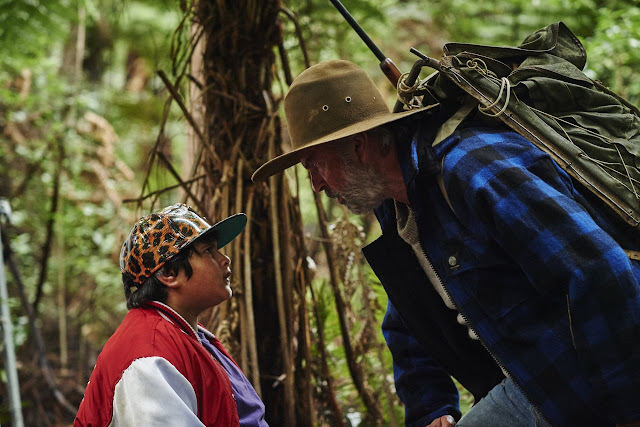 After spending years in foster homes, thirteen year-old Ricky Baker (Julian Dennison) seems to have finally settled with bubbly Bella (Rima Te Wiata) and her reserved bushman husband Hec (Sam Neill). However, tragedy results in Ricky and Hec going on the run through the New Zealand wilderness whilst a manhunt lead by Child Services and the police builds. From the onset Waititi's style is effervescent and engaging, from unexpected moments of comedy (through one-liners and playful cutaways) to his immersive and atmospheric visual palette capturing the beauty of the New Zealand wilderness. This playful style continues throughout and is supported by a narrative that combines laughs and heart in equal measure resulting in a combination that is effortlessly watchable and attention-holding. Waititi has crafted a film that ultimately deserves to be regarded as a family-classic film - filled with enough wonder and adventure for young children, rebellious enough for teens, and quirky and amusing enough for adults - not to limit its appeal to these crude categories. Waititi's screenplay adapts the Barry Crump novel of the same name, but one cannot shake Waititi's own unique style from the proceedings. This is a narrative packed with countless popular culture references - Rachel House's CPO Paula Hall in particular has a ball with them - best exemplified in a hilarious Sarah Connor chin-up reference. These references convey part of Waititi's spark - a love for the medium of film, something that beats through the heart of Hunt for the Wilderpeople. There is further power given in the film's failure to present complex themes and emotional in a manipulative or condescending manner, instead Waititi shines in capturing the world through the eyes of a thirteen year-old - refreshingly simple, effortlessly touching. Cinematographer Lachlan Milne captures the picturesque beauty of the New Zealand bush channelling an evocative, almost mythical spirit into this gorgeous canvas. Paired with a synth-tinged soundtrack from Moniker, Hunt for the Wilderpeople's unique aesthetic spirit is only furthered. Much of the heart and humour of Hunt for the Wilderpeople is down to pitch-perfect performances from the film's game cast. Julian Dennison leads with a spirited, self-deprecating gusto with a genuinely great comic sensibility. This also boasts Sam Neill's most impressive turn in some time allowing the actor to bring a grizzled charm and deadpan humour to the fold as the quietly caring Hec, whilst Rima Te Wiata delivers a hilarious and beautifully maternal performance as Bella. Rachel House is also a standout as the tremendously over-zealous CPO on the trail of Hec and Ricky. A cameo from Waititi as a confectionery-naming minister only adds to the fun spirit of Hunt for the Wilderpeople. Hunt for the Wilderpeople is a majestic piece of cinema. Refreshingly original, filled with charm and good spirits and performances which amuse and touch. It's a modern classic. Stars: Sam Neill, Julian Dennison, Rachel House & Rima Te Wiata.